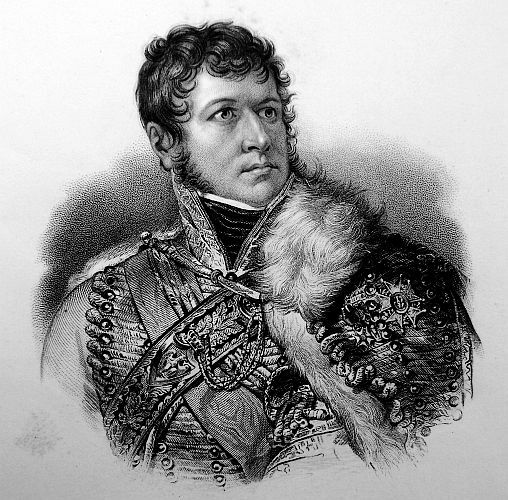 By early November, Lannes was with the army on the road to Arcola. He was still weak from his wound but was still willing to fight. The French advanced on the Austrians who were moving towards Arcola. 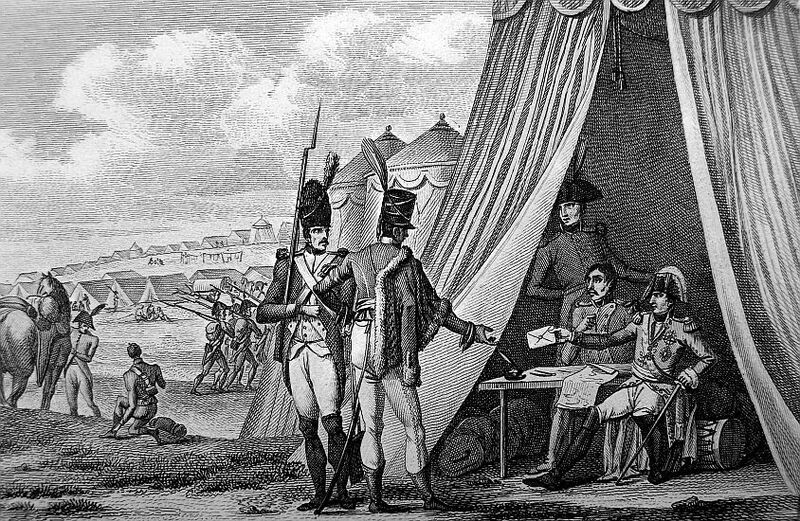 After crossing the Adige River, Augereau, Lannes, and Verdier came upon the Austrians. They continued the chase and upon crossing the bridge over the Alpone River, Lannes was shot twice and had to be taken to a field hospital. The French were rallied by Bonaparte who led a charge while holding a French flag, but even they were turned backed and the Austrians held their position. Lannes heard the continuing battle and went to rejoin his men. He would try again to cross over the bridge, but was wounded again and the charge halted. The battle would last several days until the Austrians withdrew. The Austrians would again regroup in order to relieve those under the Siege of Mantua. However, once again the Austrians were forced to retreat and the city capitulated. 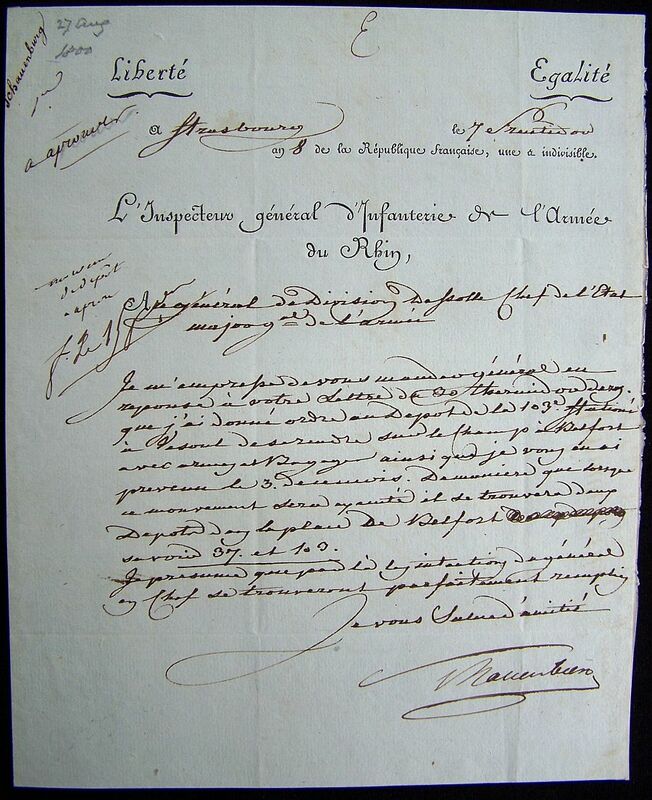 On the 18th of January, Lannes and Victor were ordered south to convince Pope Pius VI that the French were determined to stay in Italy. However the Papal States had an army and it would fight, but it did not stand a chance over the seasoned French. 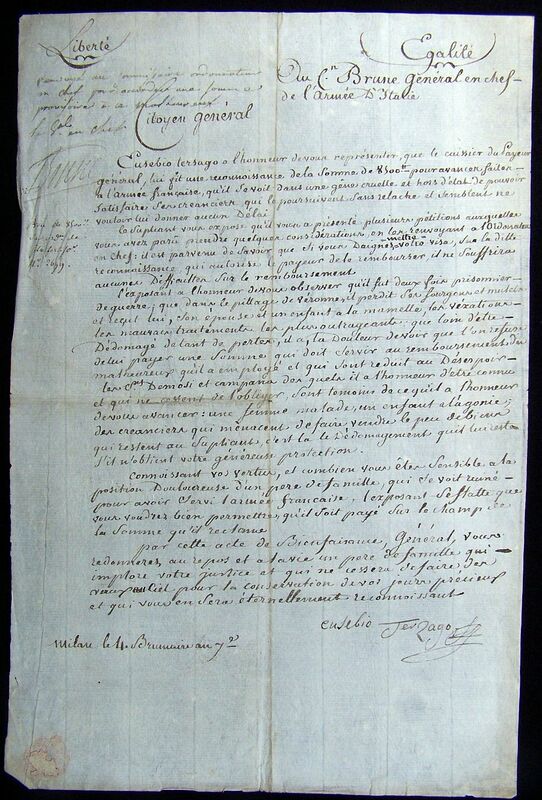 The Pope had no choice but to sign the Treaty of Tolentino. 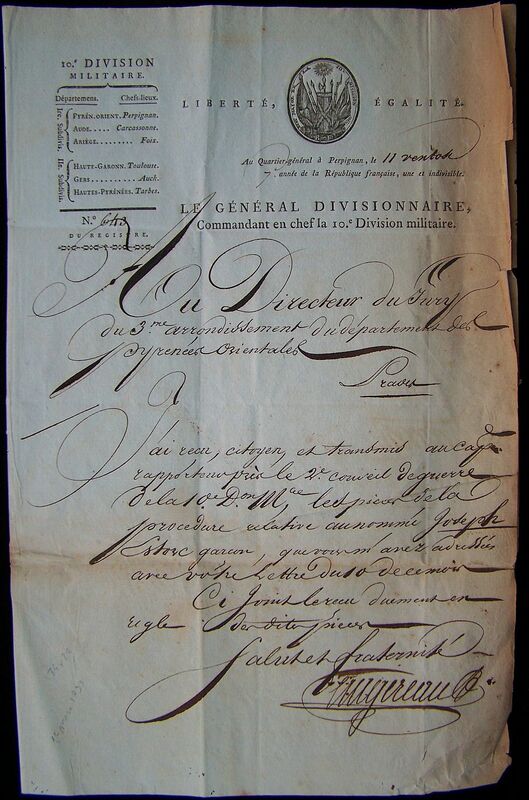 Lannes was now ordered to Mombello where Bonaparte established his headquarters. He would now spend his time trying to make due during this time of peace, so he sent for Polette. He and his wife would spend a couple of months reacquainting with each other, and he sent her home some what happy lavished in gifts. 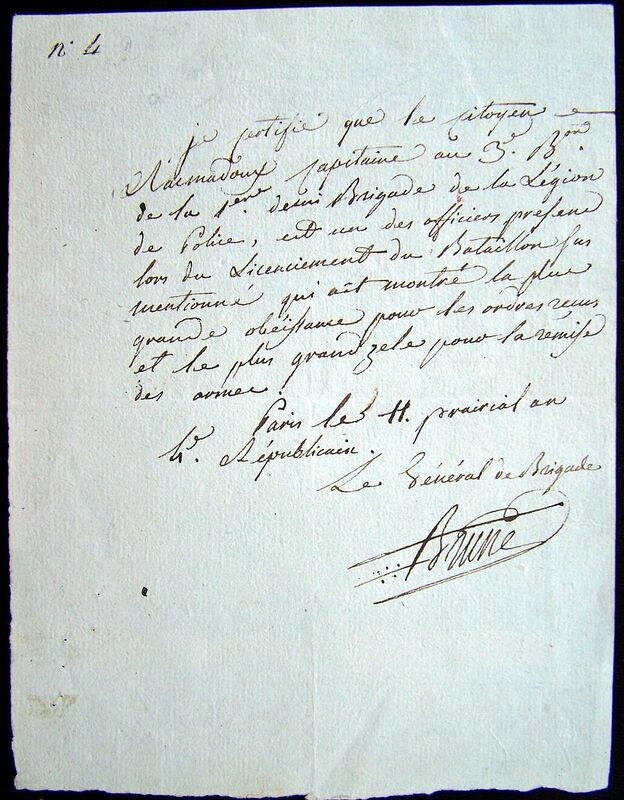 Lannes was now sent to Genoa to observe the turnover of the old government to the new Lingurian Republic. After this was accomplished he was finally able to return home, but he would soon rejoin Bonaparte in Paris. The would inspect the forces that would be used for the invasion of England. However plans change and he would soon find himself participating in a grand adventure. BUONAPARTE, COMMANDER IN CHIEF OF THE ARMY OF ITALY TO THE EXECUTIVE DIRECTORY. I have to give you an account of the operations which have taken place since the 2d instant. I was informed on the 31st of October, that an Austrian corps was advancing and had already reached the Piava. I immediately detached General MASSENA with a corps of observation to Bassano on the Brenta, with the orders to retreat to Vicenza the instant the enemy should have passed the Piava. I ordered General VAUBOIS to attack the enemy’s post in the country of Trente, and above all to drive them from the positions between the Lavis and the Brenta. The attack took place on the 2d instant; and a very brisk resistance was made. General GUIEU carried St. Michael, and burnt the enemy’s bridge; but the Austrians defeated our attack on Segouzano, and the 85th demi-brigade was very ill-treated, notwithstanding its valour. We have taken 500 prisoners, and killed a great number of the enemy. 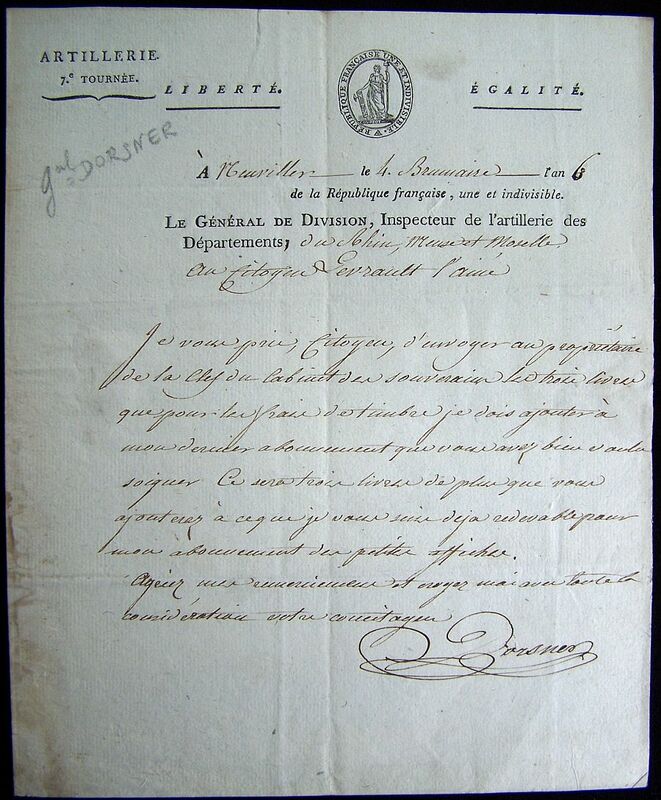 On the 3d I ordered Segouzano to be attacked, as it was necessary we should have it in our possession; and at the same moment I was informed that the enemy had passed the Piava, I pressed forward with AUGEREAU’S division. We joined that of MASSENA at Vincenza, and we marched the 5th to meet the Austrians, who have passed Brenta. It was necessary to strike them like a thunder bolt, and sweep them before us on the very first motion. The action was obstinate and bloody, but the advantage inclined to our side. We remained in possession of the field of battle, and the enemy repassed the Brenta. We took one piece of cannon, 500 prisoners, and killed a great many. General LANUS received a sabre wound. All the troops have covered themselves in glory. However, on the 3d, the enemy had attacked General VAUBOIS in several points, and threatened to turn his corps, which obliged him to retreat to Pietra, his right supported by some mountains, and his left by Mori. The enemy presented themselves on the 6th, but on the following day a most obstinate action was fought. We had already taken two pieces of cannon and 1300 prisoners; when, on the approach of night, a panic seized a part of the troops. On the 8th the division occupied a position at Rivoli and Corona, by means of a bridge which I had purposely ordered to be thrown over. The enemy loss must have been very considerable. Having heard something of what was going on in the Tyroleze. I hastened to set off the 7th, at break of day, and we arrived at Verona at noon the following day. On the 11th, at three o’clock at noon, being informed that the Austrians, after leaving Montebello, had encamped at Villa Nova, we marched from Verona, and met their vanguard at Saint Martin. It was attacked by AUGEREAU, who routed it, and pursued it three miles and a half. Night saved it. On the 12th, at break of day, we found ourselves in the presence of the enemy. It was incumbent on us to defeat him instantaneously. We made our attack with skill and gallantry. MASSENA’S division attacked the left, AUGEREAU’S the right. Our success was complete. 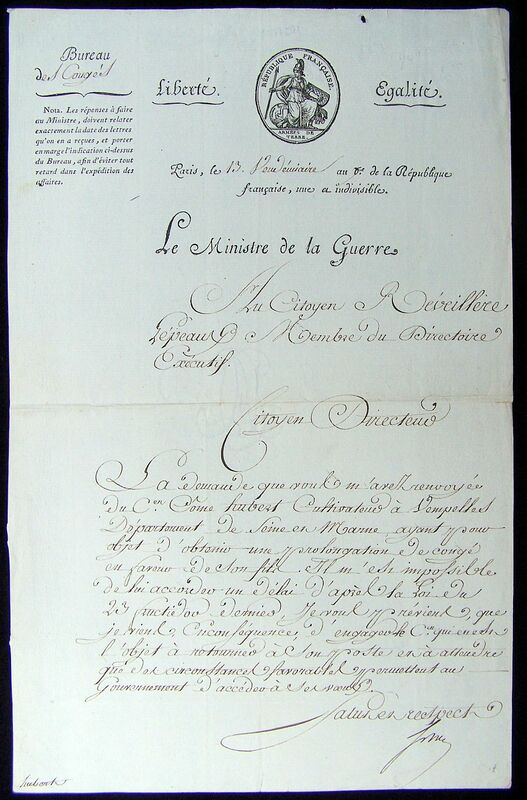 General AUGEREAU to possession of the village of Cordera, and made 200 prisoners. But the rain, which fell very largely, having changed on a sudden into a kind of cold hail, which was carried into the faces of our soldiers, favoured the enemy: this circumstance, united with a corp of reserve, which had no share in the action, gave the Austrians an opportunity to retake the heights. I dispatched the 75th demi-brigade, which had been reserved, and all was maintained till night. The two armies retained their positions. The time continues very bad. The troops enjoy repose today. Tomorrow we shall act according to the enemy’s movements. BUONAPARTE, COMMANDER IN CHIEF, TO THE EXECUTIVE DIRECTORY. “I have been so harassed with fatigue, Citizens Directors, that it has been impossible for me to make known all the military movements that have proceeded the battle of Arcola, which has decided the fate of Italy. In formed that Field Marshal ALVINZI, commanding the army of the EMPEROR, approached Verona, for the purpose of forming a junction with the divisions of his army in Tyrol, I filed off along the Adige, with the divisions of AUGEREAU and MASSENA, and in the night of the 24th and 25th(Nov. 14th and 15th), threw a bridge of boats across at Renco, where we passed that river. I was in hope of arriving in the morning at Villa Nova, and by that means taking the enemy’s park of artillery and baggage, and attacking them in the flank and rear. The head-quarters of General ALVINZI were at Caldero. But the enemy, who had heard of some movements, had sent a regiment to Croate, and some regiments of Hungarians, into the village of Arcola, extremely strong by its position in the midst of marshes and canals. The village stopped the advance guard of the army during the whole day. It was in vain that all the Generals, feeling the importance of the time, precipitated themselves at its head to oblige our columns to pass the little bridge of Arcola. Too much courage was dangerous. The were almost all wounded. Generals VERDIER, BON, VERNE, LANNES, were all put out of combat. 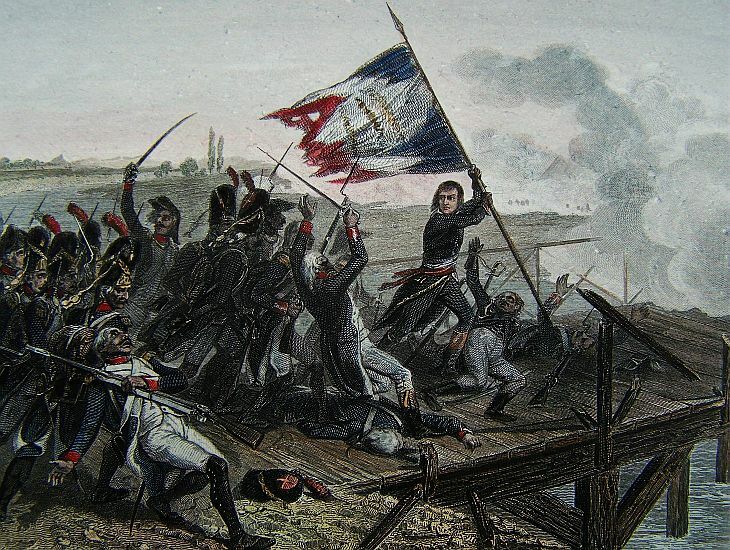 AUGEREAU, laying hold of a standard advanced to the extremity of the bridge, where he remained for several minutes without producing any effect. Meanwhile it was necessary to pass that bridge, or take a circuitous route of several leagues, which would have made our whole operation miscarry; I repaired myself to the spot; I asked the soldiers if they still were the conquerors of Lodi; my presence produced an emotion among the troops, which still determined me to risk that passage. 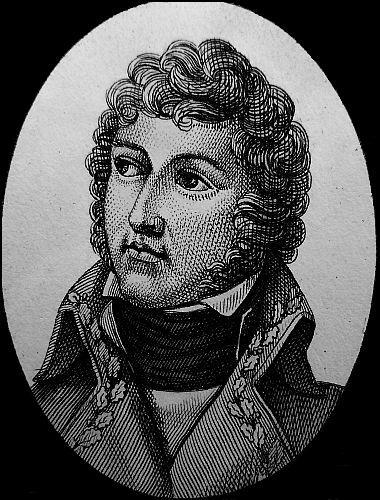 General LANNES, already wounded twice with shot, received a third and more dangerous wound. 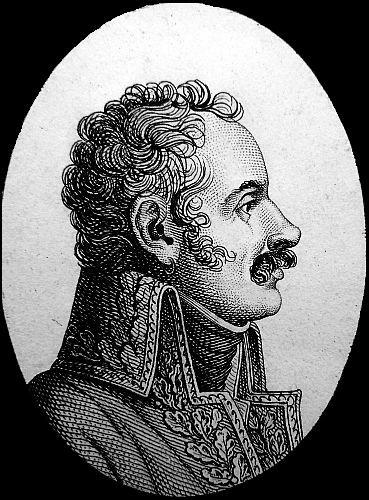 General VIGNOLLE was also wounded. We were obliged to renounce forcing the village in front, and wait till a column commanded by General GUIEU, whom I had sent through Albaredo, had arrived; he did not arrive till night, took the village, four pieces of cannon, and made some hundreds prisoners. In the interval General MASSENA attacked a division which the enemy made defile from their head-quarters against our left, decimated it, and put it completely to the route. I had been thought expedient to evacuate, during the night, the village of Arcola, and we expected at day-break, to be attacked by the whole army of the enemy, who were found to have had time to file off with their baggage and parks of artillery, and to advance to the rear to receive us. At day-break, the combat commenced every where with the greatest alertness. MASSENA, who was on the left, put the enemy to the route, and pursued, them to the gates of Caldero. General ROBERT, who was on the middle causeway with the 75th, defeated the enemy with the bayonet, and covered the field of battle with dead bodies. I ordered the Adjutant General VIAL to advance along the Adige, with a half brigade to turn the whole left of the enemy, but the country presented invincible obstacles; it was in vain for the brave General to plunge himself up to the neck in water; he could not effect a diversion of any consequence. In the night between the 26th and 27th(Nov. 16th and 17th), I had bridges thrown over the canals and the marshes. 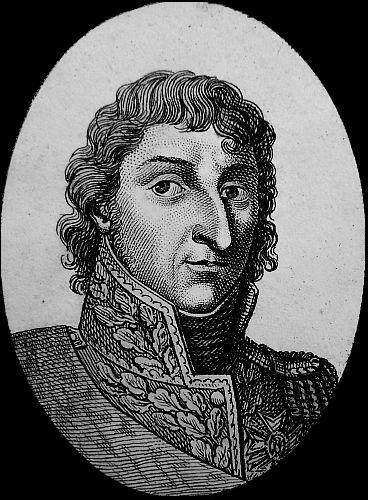 General AUGEREAU passed them with his division. 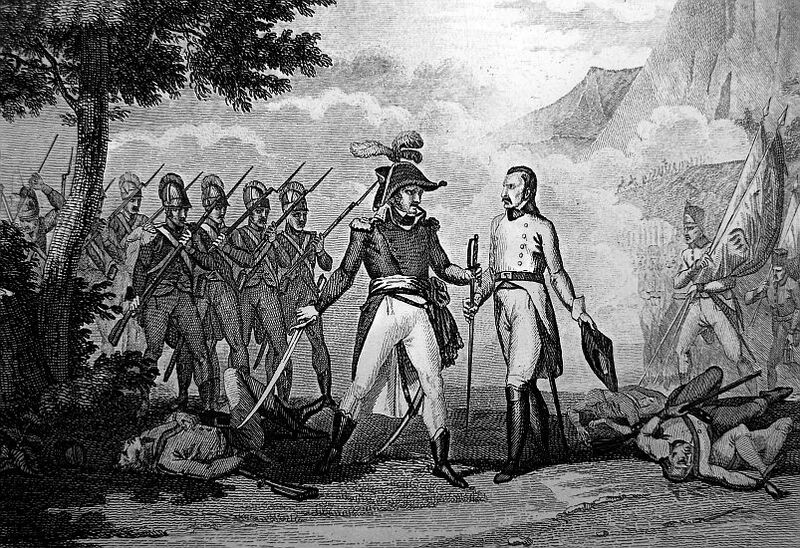 At six o’clock in the morning we were within sight; Genral MASSENA, on the left; General ROBERT in the center, and General AUGEREAU on the right. The enemy attacked the center vigorously, which fell back. I then drew the 32d from the left, and placed it in ambuscade in the woods, and the instant the enemy pressed the center, and was on the point of turning our right, General GARDANNE, at the head of the 32d, sallied forth from his ambuscade, took the enemy in flank, and made a horrible carnage. The left of the enemy was supported by the marches, and awed our right by their superior number. I ordered Citizen HERCULE, the officer of my guides, to chose 25 men of his company, to advance along the Adige, to the distance of half a league, to turn all the marshes which supported the enemy’s left, and to fall afterwards, in full gallop, into the enemy’s rear, and make several trumpets sound. This manoeuvre was perfectly successful; the hostile infantry gave way, and General AUGEREAU took advantage of the movement. But it still made resistance, though it was retreating, when a small column of between 8 and 9,ooo men, with four pieces of cannon, whom I had made defile through Porto Lignago, to take position in the rear of the enemy, and to fall upon their backs during the combat, finished by completely putting them to the route. General MASSENA, who had returned to the center, marched straight to the village of Arcola, which he took, and pursued the enemy to the village of St. Bonifacio; but night prevented our going further. 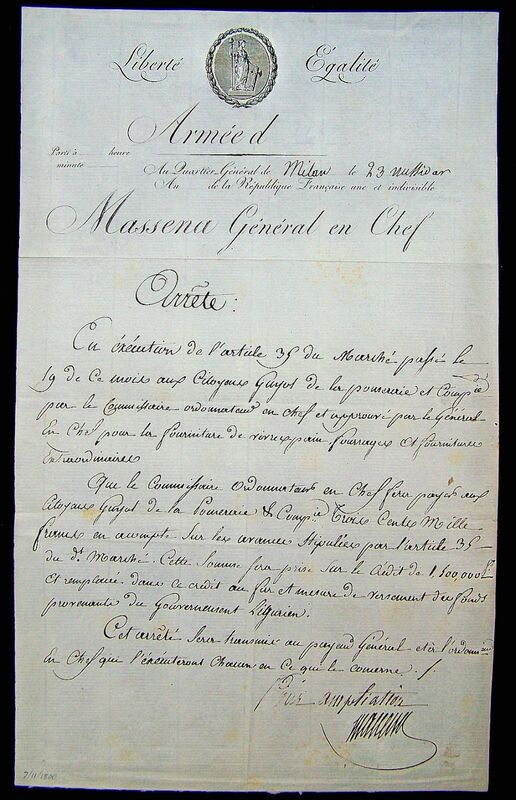 Extract of Letter fro General in Chief BUONAPARTE, to the Executive Directory. Head-Quarters at Roverbella, 28 Nivose, (Jan 17). There have occurred since the 23d, operations of such great importance, and which have been accompanied with so many actions, that it is impossible for me before tomorrow to present you with a detail of particulars; I shall now barely enumerate them. Upon the 20th Nivose, the enemy attacked the division of General MASSENA before Verona, which produced the battle of St. Michel, where they were completely beaten. We took 600 prisoners, and three pieces of cannon. 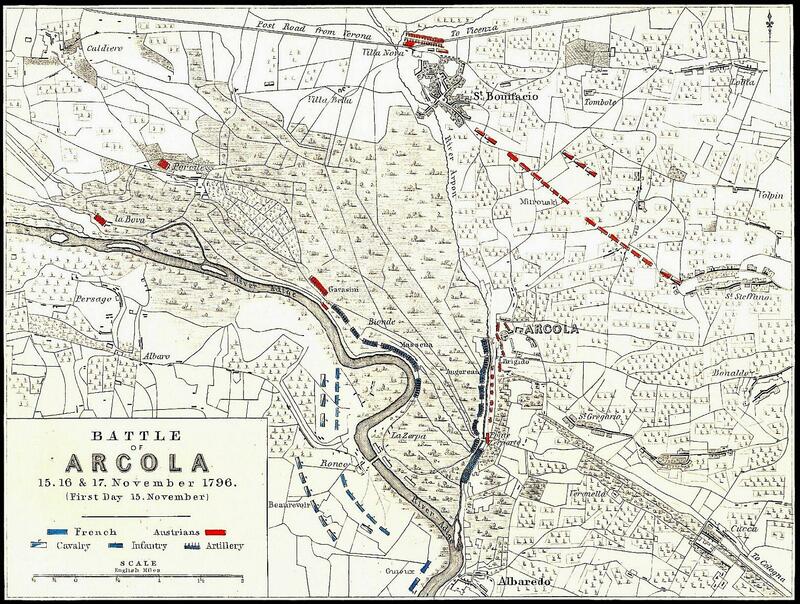 The same day they attacked the head of our line at Montebalda, and produced the battle of Coruna, when they were repulsed with the loss of 110 prisoners. Upon the 23rd at midnight, the division of the enemy’s army, which had taken post at Bevelaqua ever since the 19th, when they compelled the advanced guard of the division of General AUGEREAU to fall back, hastily three a bridge over the Adige, a league from Porto Legnago, opposite Anguiari. Upon the 24th in the morning, the enemy caused a very strong column to defile by Montagna and Caprino, and this compelled the division of General JOUBERT to evacuate Corona, and concentrate themselves at Rivoli. I had foreseen this movement. I repaired thither at night, and the battle of Rivoli ensued, which we gained upon the 25th and 26th, after a resistance; at which place we made 13,000 prisoners, took several stand of colours and pieces of cannon. General ALVINZI, almost alone, with great difficulty escaped. 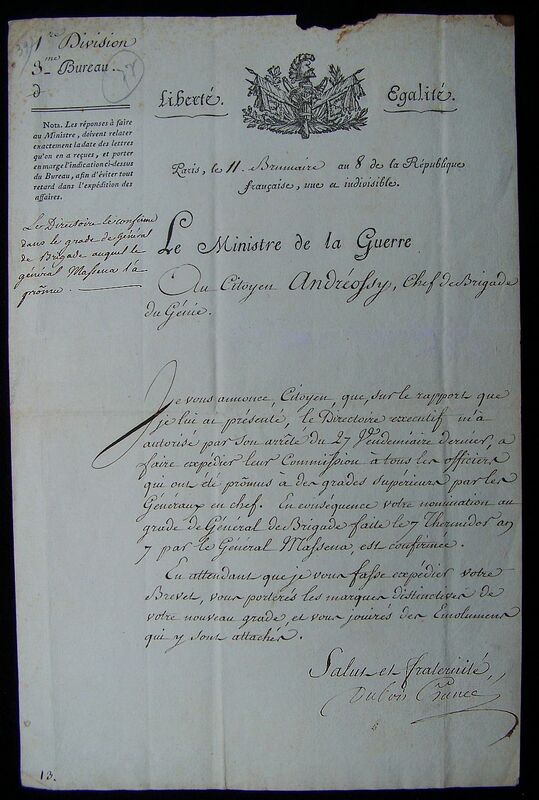 Upon the 25th General GUYEUX attacked the enemy at Anguiari, to attempt to throw them into confusion before they had entirely effected their passage. He did not succeed in his object; but he made 300 prisoners. 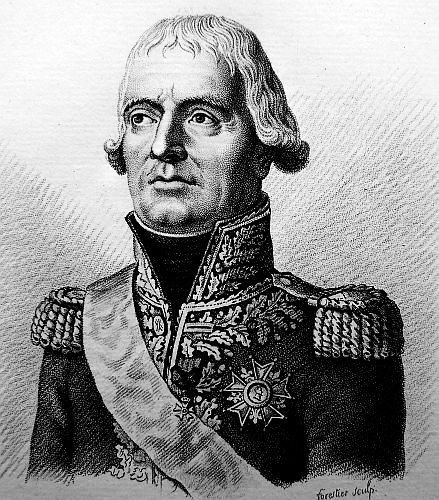 Upon the 26th General AUGEREAU attacked the enemy at Anguiari, which produced the second battle of Anguiari. He made 2,000 prisoners, took 16 pieces of cannon, and burnt all their bridges over the Adige; but the enemy taking advantage of the night; filed straight towards Mantua. They had already advanced within cannon shot of this place. They attacked St. George’s, a suburb, which we had carefully entrenched, and they were unable to carry it. I arrived in the night, with reinforcements, which produced the battle of La Favorite, and I now write to you on the field of battle. The fruits of this battle are 7,000 prisoners, a number of standards, cannon, and all baggage of the army, a regiment of hussars, and a considerable convoy of provisions and oxen, which the enemy attempted to introduce into Mantua. WURMSER tried to make a sortie to attack the left wing of our army, but he met with the usual reception, and was obliged to return. Behold then in three or four days the fifth army of the EMPEROR entirely destroyed! We have taken 23,000 prisoners, among which are Lieutenant-General, two Generals, 6000 men killed or wounded, 60 pieces of cannon, and about 24 stand of colours. All the battalions of the Vienna Volunteers have been taken prisoners. Their colours are embroidered by the hands of the EMPRESS. The army of General ALVINZI was near 50,000 men, a part of which had come post from the interior of Austria. The moment I return to head-quarters I will transmit you a detailed account, to inform you of the military movements which have taken place, as well as to acquaint you with the different corps and individuals who have distinguished themselves. 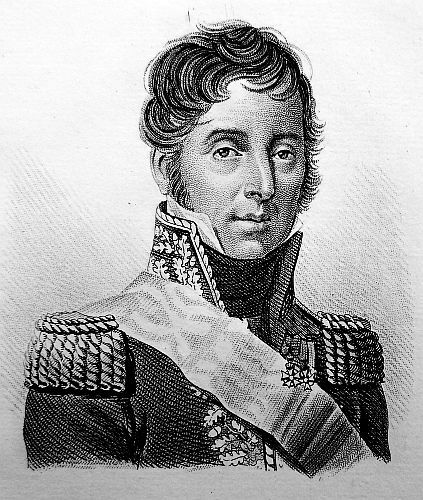 General BERTHIER, Chief of the Etat-Major-General. Verona, 30, Nivose, Jan 19. After the defeat of the Austrian army commanded by General WURMSER, and his forced flight into Mantua with a part of the wreck of his army, The EMPEROR made every possible sacrifice, and discovered a degree of activity and excertion beyond what we have ever employed. He detached troops from the army of the Rhine, and from all his States that were brought forward with the utmost expedition, and about the 10th Fumaire, ALVINZI found himself at the head of an army greatly superior to that of the Republic. 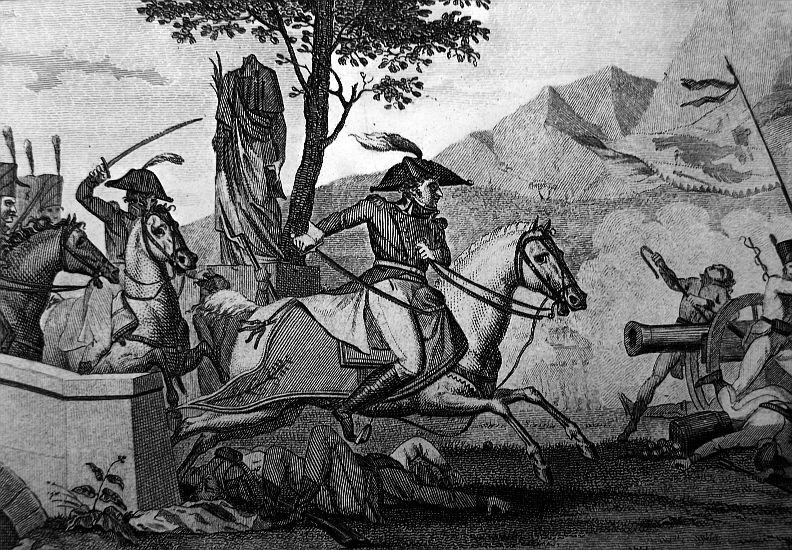 General ALVINZI caused the Tyrol to be attacked; he advanced in the mean time with his left wing on the Brenta, with a view of approaching the Adige; but being anticipated by the activity of BUONAPARTE, and counteracted by his superior talents, this General was beat, as has already been described, in the actions which took place on the 14th, 15th, 16th, 17, 21st, and lately on the 25th, 26th, and 27th, at the famous battle of Arcola. 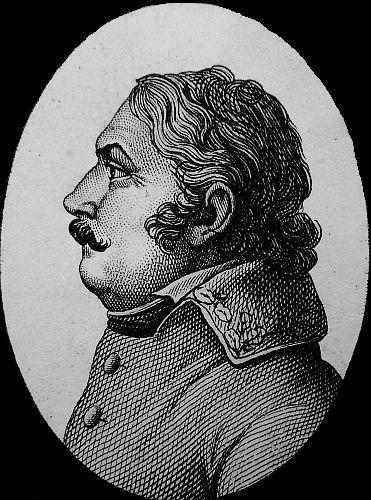 The EMPEROR, intstead of being discouraged, strained his utmost efforts to assemble a new army; he stript the whole of his frontiers; all the young men of Vienna were formed into a corps of volunteers; in fine, every thing that infatuation, obstinacy, and the most virulent animosity against the army of Italy could suggest, was put in practice. In fact, a new army of between 40 and 45,000 men, fully equipped, and a formidable artillery, inspired the enemy with the utmost confidence, that they should be able totally to defeat the French, and effect the deliverance of Mantua. BUONAPARTE being apprized of the rapidity with which the forces of the EMPEROR were advancing, earnestly urged that the march of the reinforcements, which had been promised by Governments, should be accelerated. The Court of Rome, without being dangerous, armed, and brought the small body of troops which it had on foot, nearer to Romagna, in order to harass the States of Reggio, Bologna, Ferrara, and Modena, which had discovered the energy to declare themselves free. Some letters that were surprised, informed us that it was the wish of the EMPEROR that if WURMSER did not receive timely succour, he should attempt to escape with the garrison, and throw himself either into the territory of Ferrara, or into the States of the POPE. BUONAPARTE, whose masterly genius is equal to every difficulty, took his measures accordingly; he detached from the different divisions of his army, without weakening them, a body of troops, who formed a moveable column, and assembled at Bologna a column, which, in consequence of the different directions in which the troops arrived, was supposed altogether to amount to upwards of 15,000 men. Tuscany and Rome were alarmed, the latter States thought that already an army was ready to march. The moral effect was the same as if the army had already been in march; but the eye of BUONAPARTE was on the Po, on the Adige, and on the movements of the left of the enemy, and on any measures which General WURMSER might attempt, either to escape from Mantua, or effect a junction of forces with ALVINZI. The most precise orders were given in all the active divisions of the army to be prepared to oppose such an attempt. On the 20th Nivose, BUONAPARTE arrived at Bologna; on the 21st, reviewed his troops, and settled his arrangements. 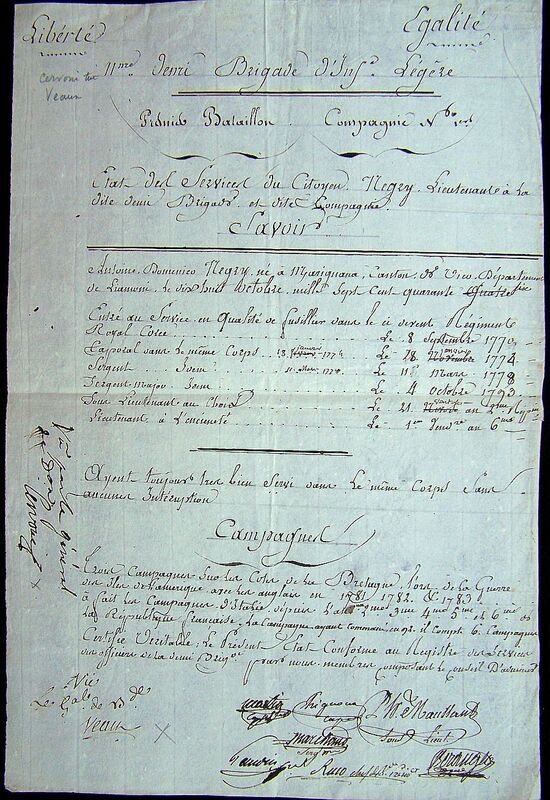 On the night of the 21st, he informed that the enemy had made a movement with the whole of their line, that on the 19th the advanced guard of General AUGEREAU, which was at Bavelaque, before Porto-Legnago, was attacked; that this advanced guard, after having fought during the whole day, had fallen back, and that from the fault of some waggoners, who cut the traces of their horses, we lost two pieces of cannon in the retreat, which was, however, gallantly conducted by a body of Frenchmen, greatly inferior in number to the enemy. 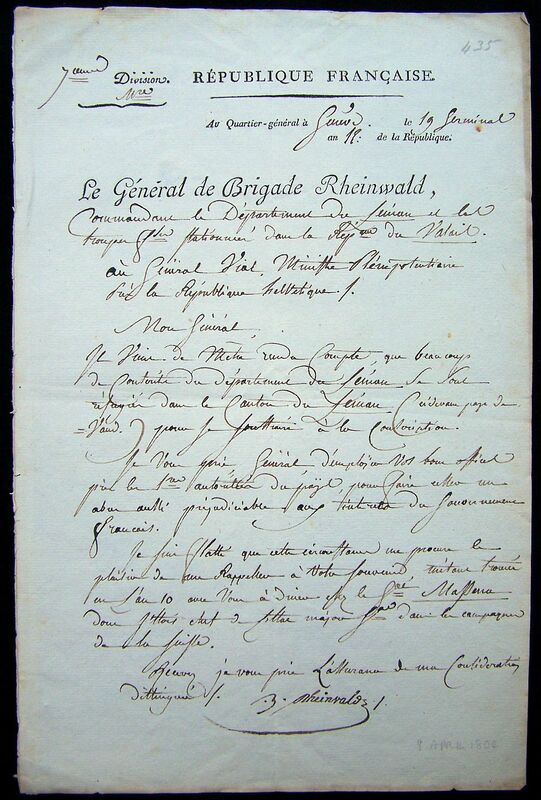 The Adjutant-General DESAIX, particularly signalized himself on this occasion by his courage and address. BUONAPARTE left the necessary forces in the four provinces on this side of the Po, and immediately ordered 2,000 chosen men from the moveable column which he had formed to proceed by a forced march to reinforce the division of General AUGEREAU, and to oppose any enterprize which the enemy might attempt on the Lower Adige. He himself set out for the blockade of Mantua, where he gave all the necessary orders, and then repaired to Verona, where he arrived on the morning of the 23d, at the movement that the enemy in great force were attacking the advanced guard of the division of General MASSENA, who was at St. Michael. This engagement was obstinate, the enemy at first gained some advantages, but were quickly arrested in their career. 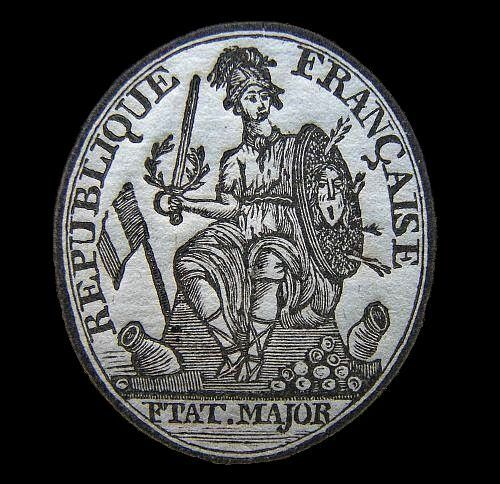 The 25th demi-brigade, commanded by a General of Brigade, BRUNE, who displayed infinite courage and ability, greatly contributed to the success of this day. The grenadiers of this demi-brigade, carried with fixed bayonets a battery of the enemy. The cavalry, commanded by General LECLERC, greatly signalized themselves, and at two o’clock the enemy were repulsed. 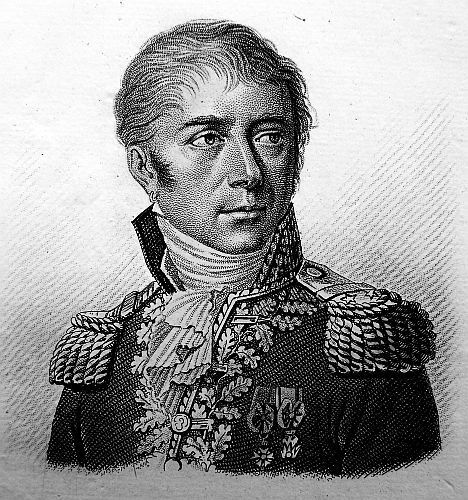 General MASSENA, who directed the movements, took from the enemy 700 prisoners, and several pieces of cannon. 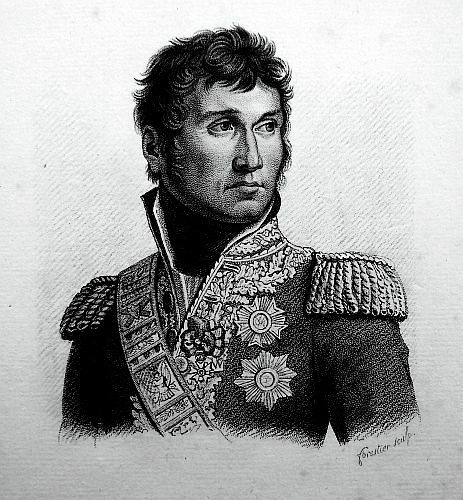 At the same moment that the advanced posts of MASSENA were attacked, General JOUBERT was also attacked at Corona, where the enemy obtained some slight advantages, and took a redoubt; when General JOUBERT, at the head of some brave soldiers, regained the redoubt by assault, and forced the enemy to return to their position. On this occasion General JOUBERT took 300 prisoners. On the night of the 23d to the 24th, a column of the enemy, either in consequence of having lost their way, or having been employed for the purpose of surprizing the posts of the gate St. George’s, near the citadel of Verona, fought all night with our principal guards, but were repulsed. All the reports we received on the morning of the 24th announced a general movement of the enemy, of which the attack of the 23d formed a part. The enemy, to whom we must allow full credit for having perfectly concealed their movements, afforded us no means to discover whether the greater number of their forces were at Rivoli, or the Lower Adige. In this situation, BUONAPARTE thought it most advisable to remain at Verona, ready to proceed in any direction as circumstances might require. On the evening of the 21st the General in Chief was informed that the post of Corona had been attacked by forces so greatly superior, that General JOUBERT thought proper to evacuate it in order to take a position more advantageous to the inferiority of their number. We were in the mean time informed, that the enemy kept up a vigorous cannonade on the Adige, between Ronco and Porto-Legnago. The forces employed against General JOUBERT left no longer any uncertainty with respect to the intentions of the enemy. It was evident that General ALVINZY, with his main force, was desirous to penetrate by RIVOLI; forces which were double in number to those under the command of General JOUBERT. 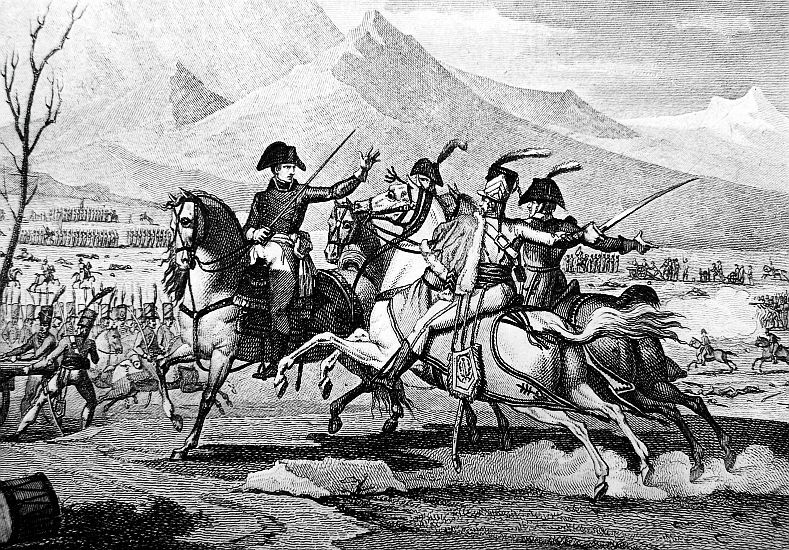 BUONAPARTE immediately made his decision, and gave his instructions with respect to the lower part of the Adige and Verona: he put in motion a part of the division of General MASSENA; he brought forward the troops under the command of General REY to Dezenzano; and after having furnished them with precise instructions, directed them in different columns towards Rivoli. At eight o’clock in the evening he set off post, with all his Etat-Majors, on the road to Rivoli, where he arrived at midnight. 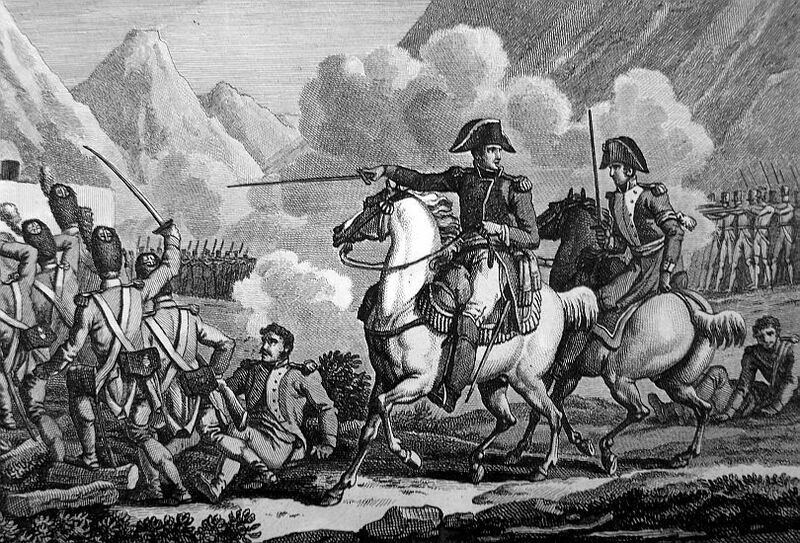 The dispositions of General JOUBERT, which were excellent for his small division, were no longer eligible, when BUONAPARTE with reinforcements came up to take the command. He ordered them instantly to resume their position before Rivoli, and particularly the gate of St. Marco, which they had evacuated, and which is the key of that position, the only point in which the enemy could bring forward their cavalry and artillery between the Adige and the Lake of Garda. BUONAPARTE, followed by the Generals commanding the divisions of his Etat-Major, employed the whole of the night reconnoitering the ground, and the position of the enemy, who occupied a formidable line of 25,000 strong, their right at Caprino, and their left behind St. Marco. 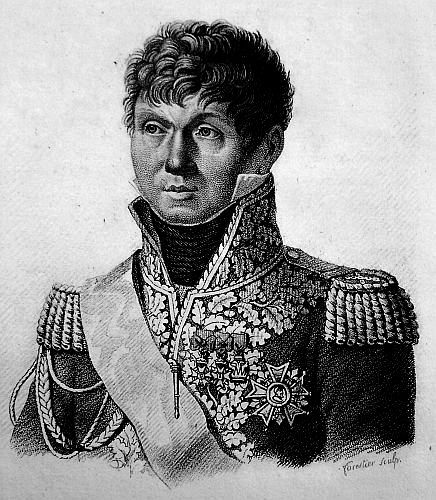 D’ALVINZI, who had arranged his plan of attack on the 24th, some days ago, did not expect the presence of General BUONAPARTE, nor the reinforcements which General JOUBERT was to receive, at the very instant of battle. As to the dispositions of General BUONAPARTE, they were all formed in his mind, and considerable latitude was left to the divisionary Generals to act after the general object of the action was attained, according to circumstances and the feeling of this moment. In consequence of which, the order was given to resume the small posts before Rivoli; the night was spent in a constant fire between the advanced posts; but the recapture of the position of St. Marco by our troops, at five o’clock in the morning, occasioned a serious battle, which disconcerted D’ALVINZI, the execution of whose plan of attack was to have taken place some hours latter. 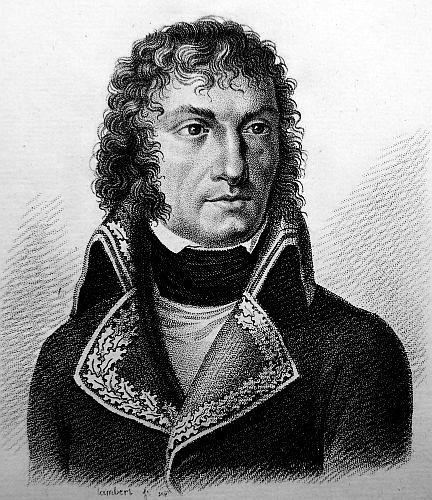 At day-break General JOUBERT, at the head of one part of his division, attacked the enemy upon the declivity of the hill of St. Marco; the other part occupied the center, and the left line was to be successively reinforced by the troops of General MASSENA, and that of General REY, which were a little too late, because the attack had actually commenced soon than it would have done on account of these circumstances. The 13th demi-brigade, which had received orders to leave Bussolingo, and to go to Carda, got new orders to draw near the place where the attack was to be made on the left, and agreeably to the principles of General BUONAPARTE, not to allow his troops to be separated, but to keep the flanks clear. General JOUBERT made the eminence on the right bank of the Adige, which commands Corona, the rest of the line advanced equally forward, and obtained some successes. The centre was upon the heights which command the villages of St. Martin. The General in Chief thought it his duty to call in the 14th demi-brigade which was in reserve. He had already ordered a battalion to go and attack St. Martin, but perceiving that the left of our line was losing ground, a circumstance which was rendered more dangerous from the troops who followed the enemy over the eminences on the right, he left me in the centre with the brave 14th demi-brigade, with orders to act according to circumstances. He went himself to the left, and in the interval, before he reached the spot, the 29th and 85th had quite fallen back. The battalion of the 14th, which had chased the enemy from St. Martin, was repulsed, but still checked the progress of the enemy by a brisk fire, which they kept up through the hedges which surrounded the village. The height occupied by the 14th demi-brigade, covered the only pass through which the right, commanded by General JOUBERT, could retreat, so that the enemy assembled all their force against the centre. The General in Chief, who perceived the importance of the post occupied by the 14th demi-brigade, and the critical situation in which it would be placed, being already entirely turned by the left wing of the enemy, were they permitted to effect a junction with the right wing, flew to the quarter in which the disorder had arisen, along with the 32d demi-brigade, which was arrived from Verona; MASSENA, the daring victory, marched at its head. The valour of this demi-brigade, with the presence of the General in Chief, soon forced the enemy to retreat in disorder, and the positions lost by the 29th and 85th demi-brigades were regained, but the right, which was upon the eminences, and which had seen the momentary confusion of the left, had fallen back, though in good order, to the height occupied by the centre, and defiled through the passage which covered the heights occupied by the 14th demi-brigade. I had the second battalion to favour the retreat of that which was between the hedges of St. Martin’s; with the third I occupied the eminence in the centre. Here this battalion beset by the forces of the centre, and a part of those of the right of the enemy, received the shock with the greatest valour: it held this position for about twenty minutes, from which the enemy could not dislodge it, and prevented them from taking two peices of cannon which were in front by my side, and which our waggoners had left. At the moment when I gave orders to a company to guard the pieces of cannon, which the enemy were endeavouring to carry off, on officer of this battalion rushed toward, calling out, “No, you shall not have our pieces!” but the enemy’s fire prevented us from getting at them, I ordered that a terrible fire might be commenced against this battery, by which all the Austrians, with the horses which were in it, were killed, and two pieces not having been carried off, will of course remain in our possession. I shall inform you the name of this brave man, whom I knew only in the action. Our left had not only recovered all its positions, but gained still more ground, when our right wing was obliged to take a position upon the Rivoli, which was not effected without considerable confusion, from the fire of a number of Austrians who had gained the heights which commanded the plateau. The enemy endeavoured to profit from it, but did not observe that, by leaving itself naked on the left, it was exposed to be cut off by the success obtained by our left, if its left experienced the smallest check. So it happened–the enemy were scattered coming down the rocks upon the little plain on the other side of the ravine, which commands the plateau of Rivoli, and upon this plateau, the key of our position, where we had 500 men, the General in Chief, who had a vigilant eye, and who had thought proper to employ a corps of cavalry, had sent us the Chief of the Squadron LASALLE, with a detachment of this army. General of Division, JOUBERT, who had his horse wounded, and who had set an example to his grenadiers in rallying his troops, rushed with a gun in his hand upon the small plateau of Rivoli, which he attacked with great fury, while I directed the small corps of cavalry in the plain, which commands the plateau on the other side of the ravine. The charge of the cavalry obtained the most brilliant success. The infantry of the centre followed up these advantage; JOUBERT regained the plateau of Rivoli, put the enemy to the route on the lower part of the Adige, and carried off several pieces of cannon. At the same instant MASSENA, profiting by the retrograde movement of the enemy, by which they had lost all the advantages by which they acquired thsi postion, made 1,800 prisoners. The General in Chief, after having settled all the dispositions which might assure the victory on his line of battle, was informed, that the enemy, who had no doubt of beating us, had marched a body of 4,000 men, who were engaged behind Rivoli, and crowned all the eminences between the Adige and the Lake of Garda, so that we were entirely turned by this corps, and had our communications with Verona and Peschiera entirely cut off. This situation did not at all disturb the General in Chief, nor the experienced soldiers; but those who saw our soldiers observing it with the same indifference, and saying at the very time that the front of the line charges with the greatest ardour, “Oh! there is more work for us!” will be able to judge what confidence the army repose in their Generals and Commanders. BUONAPARTE had sent two battalions of the 75th demi-brigade to make face to the enemy’s column, which had come round upon us. The 18th demi-brigade of the line, whose duty it was to be near on the left, as we have already mentioned, had arrived. The General in Chief disposed of it with the left of the 75th demi-brigade. The Austrians were calling out to our people, “We have them!” and they were in the act of dividing the spoil. We were near enough to hear them. There was a general fire throughout their whole line! It was a signal. 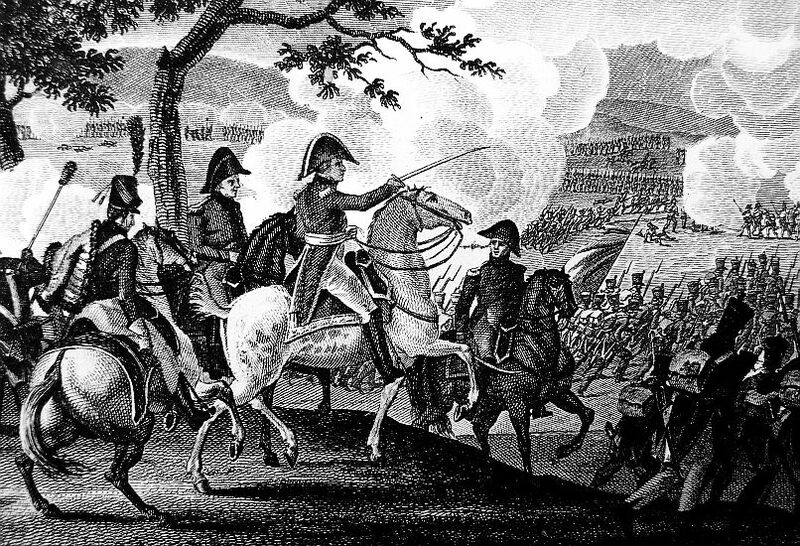 As soon as it was given, the Austrian troops rushed with fury against the intrenchments of Rivoli. They thrice returned to the charge; but they were either slain or put to flight. In the mean while BUONAPARTE had caused four pieces of light artillery to be planted, which cannonaded the right line of the enemy’s corps, which had turned round upon us. The 18th, and some troops of the 75th demi-brigade, commanded by General BRUNE and MONNIER, received orders to go, at the head of three columns, to attack the right wing of the enemy, which occupied an advantageous height, and which had turned us. Our troops set out; it seems that they were not so much for the purpose of carrying death into the enemy’s ranks: it seems rather as if it had been a training manoeuvre. The soldiers marched with shoulder firelocks, singing the hymn of Chant de Depart; they poured upon the enemy; the attack and the rout was the work of an instant. The whole line was thrown in confusion, and our thunderers pursued it. A hundred–about a hundred of our Trailleurs arrived at the same time with it at the Lake of Garda, made them lay down their arms, and brought back near 3,000 prisoners. General REY, who, from the length of his march, was stopped by the enemy’s corps, which turned us, and some of the advanced posts on both sides were for sometime engaged; but he was at too great a distance to take any decisive part in the action. 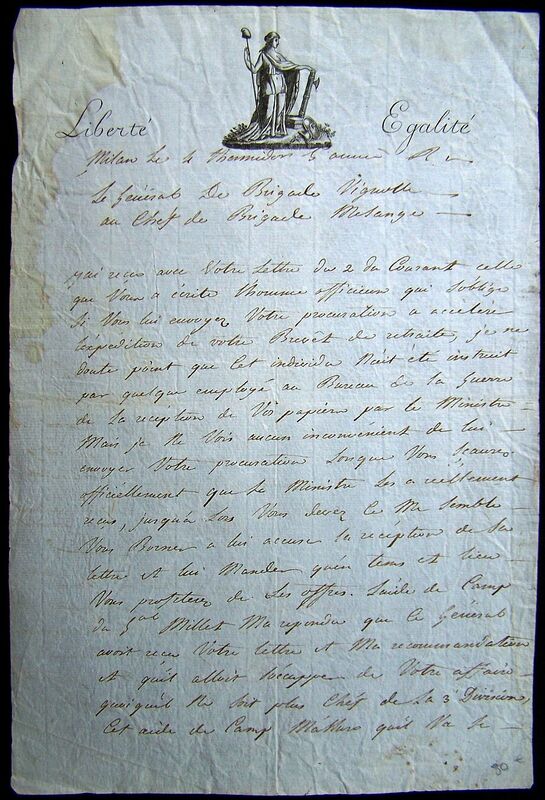 The Commander in Chief, by the reports which he had received, was informed that a brisk cannonade had taken place on the banks of the Adige, and having received no news of General AUGEREAU, he presumed that the communication between him and Verona might be intercepted. He repaired to Rivoli, gave orders to General JOUBERT to attack the enemy next day if they were still so imprudent as to retain possession of Corona. He detached to Verona and Castelnovo the troops for which General JOUBERT no longer had occasion. 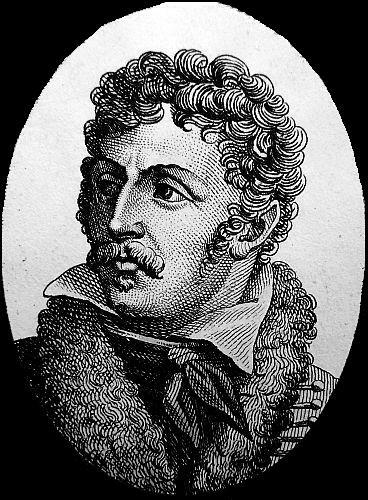 He himself instantly set out (upon the 25th and 26th) for Castelnovo, where he received the intelligence that a column of the enemy, consisting of about 10,000 men, commanded by General PROVERA, had, on the night of the 24th, forcibly passed the Adige, under the fire of a numerous artillery at Anguira, and that General CAVEUX, who guarded the Adige at this quarter, had been obliged to fall back from Ronco. The communication being cut off, he could receive no accounts from General AUGEREAU. He immediately set out for Villa Franca, to which place he detached the 57th, 18th, 32d, and 75th demi-brigades. He received information from General SERRURIER, that the enemy was at Castellara, and were marching by St. George’s towards Mantua. The 9th regiment of dragoons, and a squadron of Ercody, having fallen in, the Austrians, with German arrogance, challenged the dragoons. Citizen DUVIVIERS, Commander of the French squadron, instantly darted upon the Commander of the enemy’s division. This species of heroic duel began. DUVIVIERS, cut down his adversary with his sabre, and brought him to the ground. This was the signal of charge to both parties. The Austrians were routed, and their defeat immediately succeeded that of their Chief. 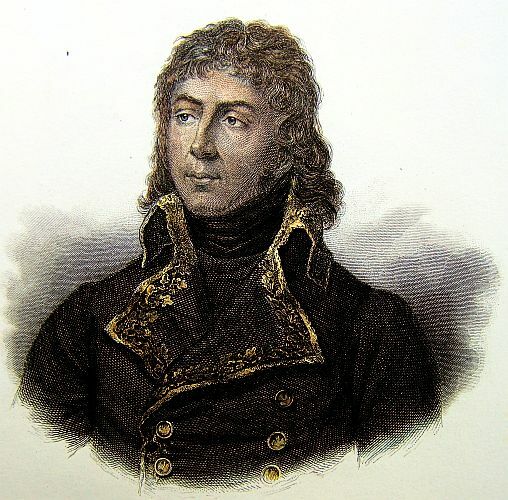 The Commander in Chief concluded that AUGEREAU, if he was not defeated, would follow the column of PROVERA, and he repaired in person to Roverbella, where he arrived upon the evening of the 25th with reinforcements. 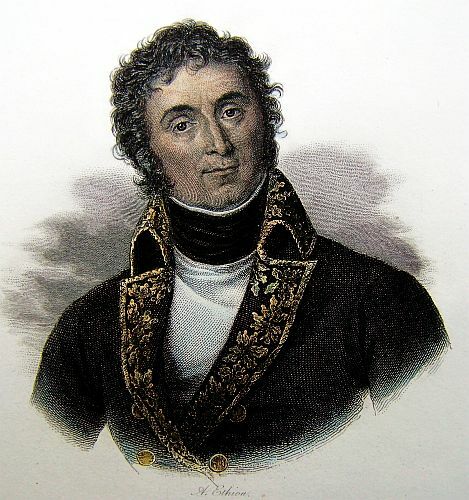 He was informed that General AUGEREAU, in the course of the day of the 25th, had collected his forces with the design of falling upon the column of PROVERA, between Anguiati and Roverquiera. PROVERA, who after his passage, had no other object in view but to march with the utmost rapidity to Mantua, could not be attacked but in the rear of his column. General POINT commanded the left of the attack; General LANNES the right, while General GUIEU and BON, marched from Ronco, to take the enemy in flank. 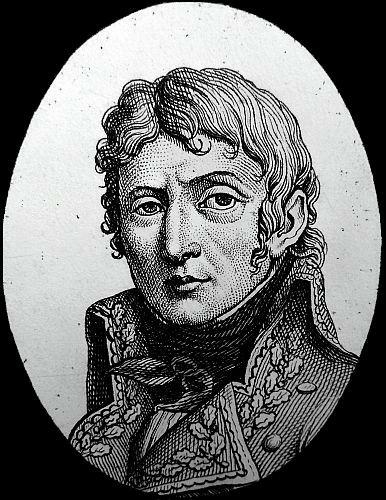 The attack was conducted with that of courage and skill which the division commanded by General AUGEREAU has so often displayed. The enemy left 2,000 prisoners, among which are 40 Officers, and 14 pieces of cannon. The bridge over the Adige was burnt down. The left of PROVERA’S column, during the whole of the engagement, filed on toward Mantua, with all their forces, to reach it if possible. 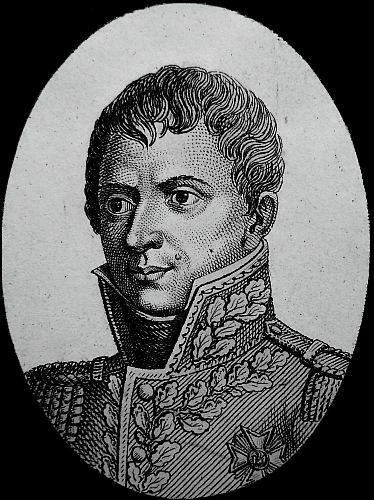 Upon the 26th in the evening, General BUONAPARTE received intelligence that General PROVERA, upon his arrival at St. George, had summoned General MIOLLIS, who defended this post, to surrender. The General replied, that he would fight, but he would not surrender. A second messenger arrived, but he sent him back with an answer equally unsatisfactory. 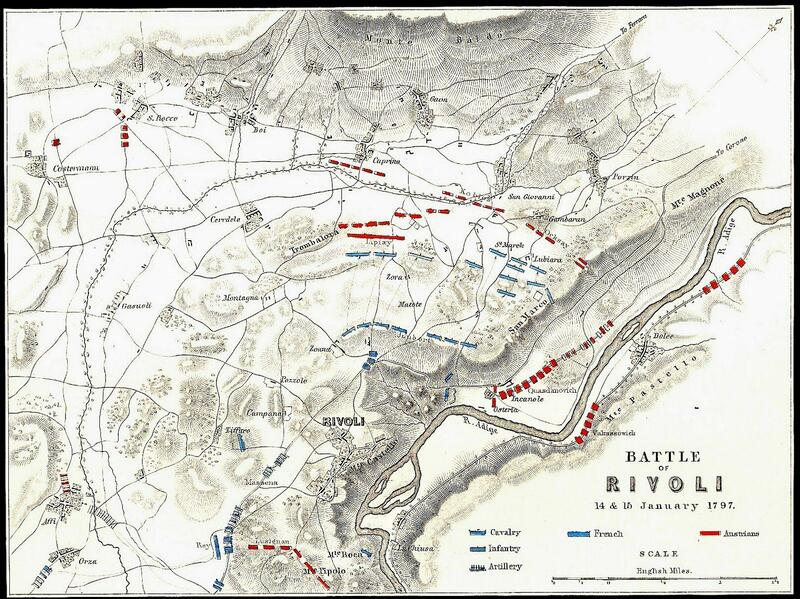 The attack made by General JOUBERT upon the 26th was attended with all the success which could be expected. The enemy, after the affair on the 25th, had kept post at St. Marco. General JOUBERT ordered General VIAL to retake it during the night of the 25th and 26th, which took up time till about two hours before day. The centre division, commanded by General BARRAGUEY D’HILLIERS, marched towards St. Martin, from which it drove the enemy with the loss of their cannon. 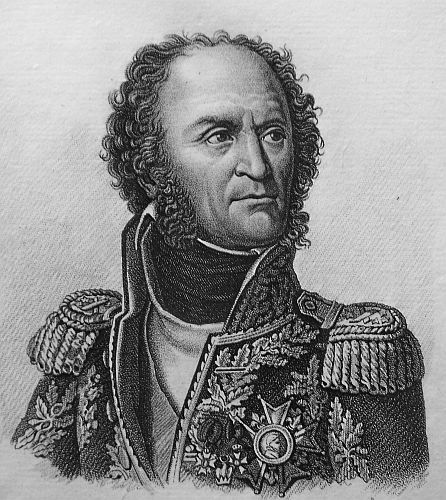 The column upon the right, commanded by General VIAL, contended for the eminences with the enemy the whole of the day, but General JOUBERT, who had directed a column, under the command of General VEAUX, to turn the enemy, and get before them towards Corona, following the route by the back of Montebaldo, actually arrived there before them. The enemy then, seeing their retreat cut off, fell into disorder and rout. They were surrounded, and 6,000 men laid down their arms. All that were below the Adige retreated in confusion towards the Tyrol. The 29th and 85th demi-brigades conducted themselves upon this occasion with valour which repaired the moment’s hesitation which they had displayed in the affair of the 25th. In the night of the 26th and 27th, the Commander in Chief repaired to St. Antoine, where he gave orders for attacking the column of PROVERA upon the 27th. The General perceiving that he could not carry St. George’s by main force, and having heard no account of the body of General ALVINZI’S army, had nothing left but to attempt, by a bold struggle, to join the garrison of Mantua, in order to fight us with advantage. The General’s object then was, to prevent this junction, and to surround the column of General PROVERA. General DUMAS was employed with a corps of observation at St. Antoine, before the citadel. 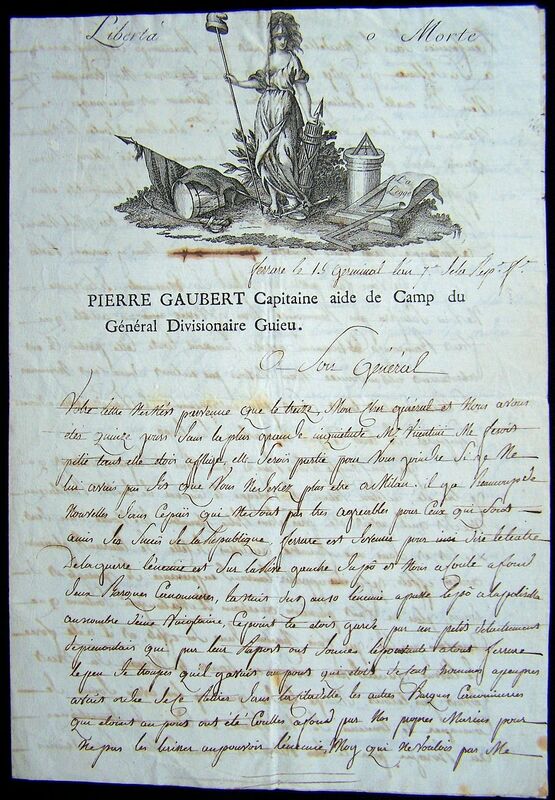 General SERRURIER, with a column consisting of 1,500 men, put himself in motion an hour before day-break, in order to reach La Favorite; while General VICTOR at the head of the 57th and 18th demi-brigade, was to turn General PROVERA. The enemy had availed themselves of the night to detach a body of men by the citadel to gain possession of La Favorite. The head of General SERRURIER’S column attacked the enemy while executing this movement. The attack began very briskly. The garrison made a considerable sortie, but being unable to gain La Favorite, they found it impossible to join the column of PROVERA. The enemy got possession of St. Antoine, but the Commander in Chief having sent a reinforcement of two battalions to this quarter, the garrison of Mantua, in spite of all their exertions, could make no progress. General VICTOR, who on this occasion displayed equal energy and talents, attacked with great spirit, and turned the column of PROVERA. 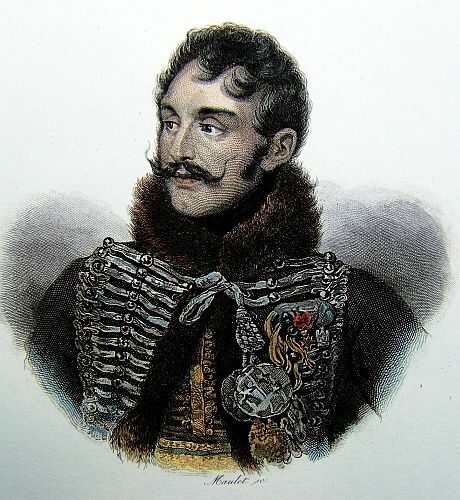 General MIOLLIS, who was at St George’s, made a sortie so seasonably, that PROVERA, a part of whose infantry and cavalry had already laid down their arms, was surrounded, with the remainder of his column. The 32d demi-brigade, which just arrived, and was supported by the 75th, forced them to lay down their arms, under the single reserve that the Officers were to retain their horses, and all the effects of them. General PROVERA, 6,000 infantry, 700 troopers, laid down their arms, and were made prisoners of. We took 22 pieces of cannon, all their carriages, and all the baggage belonging to the column. Amongst the prisoners was the whole corps of Vienna volunteers. Four hundred men of the garrison of Mantua were also taken. The rest of the troops who made the sortie returned, and our troops resumed the posts they held for the blockade of Mantua. General DUGAU, who commanded the cavalry, had his Aide-de-Camp killed; the 75th demi-brigade, who were asked if they had any cartridges, replied, that with these lads they must only charge with the bayonet. The Commander in Chief, after all these dispositions, returned to Verona. The result of the different actions, that took place between the 19th and 20th, is the total defeat of ALVINZI’S army. With regard to the killed and wounded, the number is considerable. If the most intelligent military men will hardly be able to believe these successes, although most indubitable, and most true, they will be no less surprised to hear that the loss they have cost the Republic is very trifling. I have given you a very long account of the transactions, but the friends of liberty will receive with pleasure all the details of these memorable days. I annex a list of a part of the Officers taken prisoners upon this occasion. Message from the Executive Directory to the Councils. 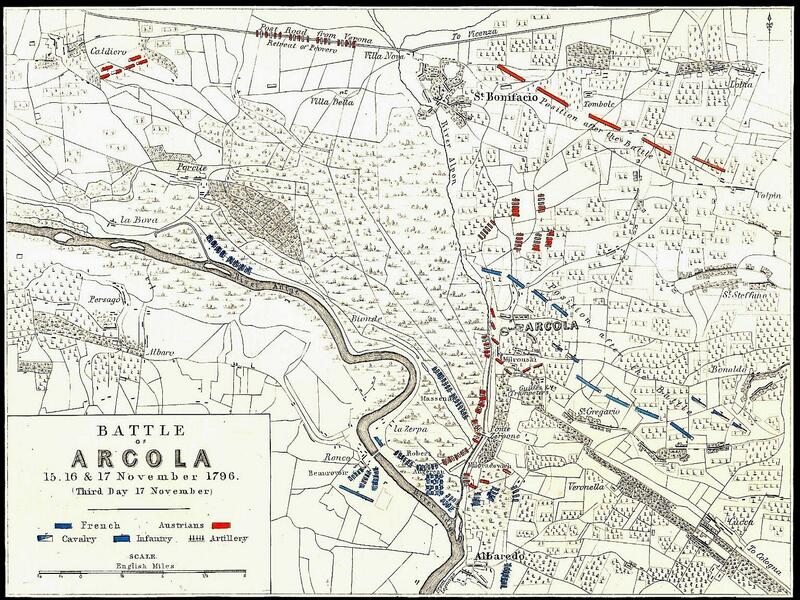 Mantua surrendered the 2d instant, at ten o’clock at night. The garrison are prisoners of war. The Executive Directory will make known the articles of capitulation. The brave army of Italy took no repose after success. It attacked and defeated the enemy in the Tyroleze, pursued him as far as St. Michel, and made 900 prisoners. On another side, a column entered the territory of the Pope. The vanguard of General VICTOR’S division, commanded by General of Brigade LANNES, in which were the grenadiers of the legion of Lombardy, attacked the army of the Poe on the Cenio, turned it in fording the river, and the enemy was assailed and routed in the same moment. The grenadiers of Lombardy carried the batteries with fixed bayonets, and covered themselves with glory. The POPE has lost in prisoners 1000 men and 26 officers, in killed from 4 to 500 men, and eight stands of colours. We have taken 14 pieces of cannon and eight caissons. There was nothing else there to take. The 7th Regiment of Hussars, commanded by Aide-de-Camp JUNOT, pursued the Papal Cavalry for 10 miles, without being able to come up with it.